My family and I recently spent a week in Puglia, Italy and ever since we returning, I’ve had a huge craving for Asian food. We did stuff ourselves on gorgeous Italian ingredients but after while I start hankering for my salty soy and ginger fix. When the weather gets nice, I love making main dish salads, and Asian are particularly refreshing. This one is full of zingy flavours and a snap to throw together. Salads are kind of my thing and hence the second posting in a row. I think I may have a little addiction problem with vinegar…..admittedly I am a bit obsessed with it and could drink it straight out of the bottle. Years ago I wrote a book called ‘The well-dressed salad’ and it will always be one of my favorite subjects to write about. The best way to make this is to buy a Peking duck kit at the supermarket, heat up the meat and then shred it. For those of you lucky enough to live near a Chinatown, you can just buy a roasted one. If neither of those work, then rub a couple of duck legs with five spice and salt and roast for 1 hour at 200c/400f and pull the flesh apart. Juicy mango, spicy lettuce and a balsamic, lime and soy dressing are tossed in with the rich meat but balance it out with freshness. Have it on its own for dinner or make it as a platter salad for a summer bbq. Preheat oven to 180c/350f. 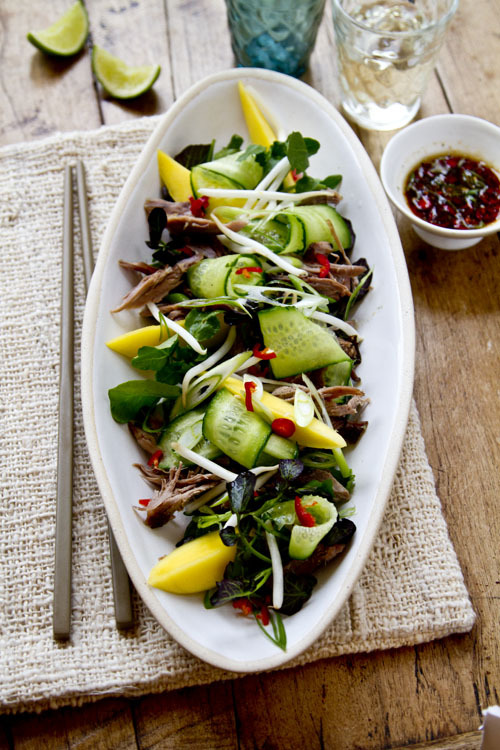 Cook the duck for 30 minutes on a baking tray and then shred the meat. If making ahead then refrigerate in foil until using. In a small bowl or jam jar, combine the dressing ingredients, shake or whisk well and set aside. Arrange the salad leaves on individual plates or a large platter. 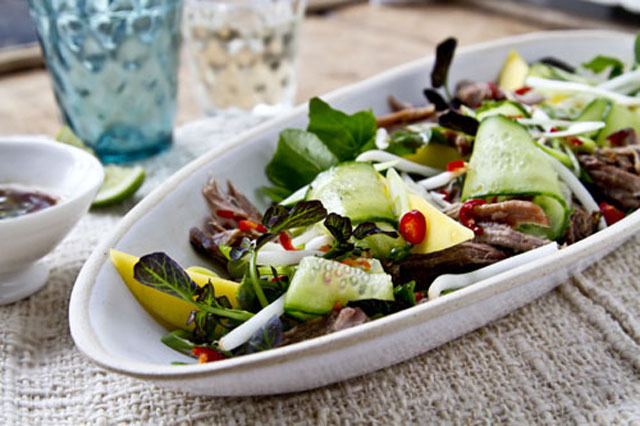 Scatter over the mango, cucumber and spring onion. Just before serving place the shredded duck in a baking dish covered with foil for 5 minutes to warm through and arrange a handful over each plate. Just before serving pour over the dressing and sprinkle over the bean sprouts and sesame seeds to serve. Love the vibrant colours in the salad, I love how you make something so simple look so good!